Review by AllTheBestFights.com: 2018-05-12, boring fight between Jon Fitch and Paul Daley: it gets one star! The current Wsof/PFL Ww champion Jon Fitch entered this fight with a pro mma record of 30-7-1 (37% finishing rate) and he is ranked as the No.16 welterweight in the world. He suffered his last loss when he faced Rousimar Palhares in 2014 (Palhares vs Fitch) after this bout he has won four bouts beating Jake Shields (Fitch vs Shields) and Brian Foster in his last two (Jon Fitch vs Brian Foster). His opponent, Paul Daley, has a record of 40-15-2 (80% finishing rate) and he entered as the No.17 in the same weight class. Semtex Daley fought three times last year defeating Brennan Ward (4-stars fight, Daley vs Ward) and Lorenz Larkin (Lorenz Larkin vs Paul Daley) but between these two bouts he lost Rory MacDonald (MacDonald vs Daley). 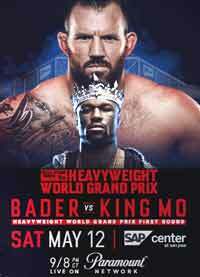 Fitch vs Daley is on the undercard of Ryan Bader vs Muhammed King Mo Lawal – Bellator 199. Watch the video and rate this fight!